(Phys.org)—A team of researchers with Warsaw University Observatory, Ohio State University and the University of Warwick has found evidence that suggests there are far fewer Jupiter-sized rogue planets roaming the Milky Way galaxy than prior surveys have shown. In their paper published in the journal Nature, the group describes using data compiled from the Optical Gravitational Lensing Experiment to analyze light curves of approximately 50 million stars for the period 2010 to 2015 and what they found by doing so. Back in 2011, an international team of researchers conducted a study of rogue planets and reported evidence suggesting that there are approximately twice as many rogue Jupiters as main sequence stars. In this new effort, the researchers took a new census gain a more accurate estimate. Identifying rogue planets is difficult, of course, because they do not emit any light of their own—against the black of space, there is nothing to see. But when they move past light emitted from a distant star, a lensing phenomenon can occur. This happens when light from the blocked star is magnified by the planet's gravity, causing a lensing halo effect that can be seen by instruments here on Earth. The size of the planet can also be calculated by noting the lensing duration. The researchers with this new census winnowed down the millions of stars in the dataset to just 2,617 high-quality microlensing events. This represented a much larger sample size than the one used by the team in 2011—they analyzed just 474 events. The researchers conclude that Jupiter-sized rogue planets are far rarer than the earlier census claimed. But they note it is possible that are more Earth-sized rogue planets roaming around than currently believed. The data also showed that of the big rogue planets roaming the Milky Way, approximately 25 percent of them are likely gas giants, with the remaining 75 percent represented by rocky or ice giants. The researchers conclude by suggesting their findings jibe with logic—there are likely to be fewer rogue giant planets because they would have a stronger gravitational connection to their original star system. Smaller, Earth-like planets, on the other hand, could be flung off with relative ease. Planet formation theories predict that some planets may be ejected from their parent systems as result of dynamical interactions and other processes. Unbound planets can also be formed through gravitational collapse, in a way similar to that in which stars form. A handful of free-floating planetary-mass objects have been discovered by infrared surveys of young stellar clusters and star-forming regions as well as wide-field surveys, but these studies are incomplete for objects below five Jupiter masses. 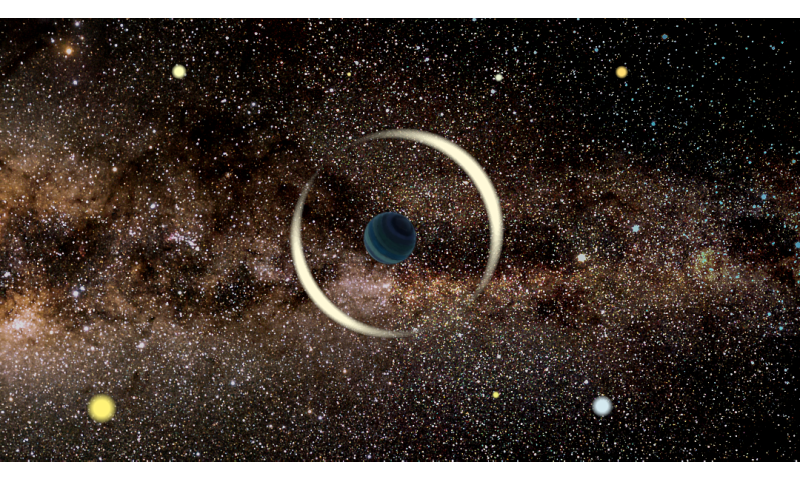 Gravitational microlensing is the only method capable of exploring the entire population of free-floating planets down to Mars-mass objects, because the microlensing signal does not depend on the brightness of the lensing object. A characteristic timescale of microlensing events depends on the mass of the lens: the less massive the lens, the shorter the microlensing event. A previous analysis of 474 microlensing events found an excess of ten very short events (1–2 days)—more than known stellar populations would suggest—indicating the existence of a large population of unbound or wide-orbit Jupiter-mass planets (reported to be almost twice as common as main-sequence stars). These results, however, do not match predictions of planet-formation theories and surveys of young clusters. Here we analyse a sample of microlensing events six times larger than that of ref. 11 discovered during the years 2010–15. Although our survey has very high sensitivity (detection efficiency) to short-timescale (1–2 days) microlensing events, we found no excess of events with timescales in this range, with a 95 per cent upper limit on the frequency of Jupiter-mass free-floating or wide-orbit planets of 0.25 planets per main-sequence star. We detected a few possible ultrashort-timescale events (with timescales of less than half a day), which may indicate the existence of Earth-mass and super-Earth-mass free-floating planets, as predicted by planet-formation theories. Always a head line winner for me. Considering it is a revision of a previous estimate (key word being estimate), "suggests" and "previously thought" are perfectly fine descriptors. If they can at some point actually count every single one, they won't need to estimate anymore and those descriptors won't be required. Hope this helps clarify! If I had a set of bathroom scales that said, "We estimate you may weigh 4Kg more this week than what we had previously thought, last week" - I'd smash it with a hammer. I agree. That would be a horrible scale, since it is supposed to actually measure and not estimate your weight.